Tag Archives: Did Christ die only for the elect? glasseyedave	. election	. Arminianism, born again, Bride, calling, Calvin, Calvinism, Calvinism’s heresy, church, Did Christ die for all men?, Did Christ die only for the elect?, doctrine, Doctrine of election, election, faith, free will, Grace, Hell, heresy of Calvinism, Holy Spirit, Holy Spirit our teacher, imputed righteousness, New Testament, promises, repent, rightouseness, Saved, the church, The gospel according to the gospel, The Gospel the church refuses to believe, Who is called? As a follow up to yesterdays post, I would like to keep discussing God’s love for mankind and the dangers of heresy in the church that would unwittingly pervert the gospel we have received. Our adversary, the devil, could not keep Christ from becoming our savior. Christ has died to take away the sins of the world and there is nothing that can be done about. But this doesn’t keep him from spreading lies about what Christ has done and what it means for mankind. The teaching of this man Calvin has grown into a doctrine unto itself. There are vast number of professing bible believers who not only follow this doctrine of Calvin, they malign those of us who do not. They accuse us who believe God so loved the whole world that, He died for the whole world and offers the whole world salvation as being ignorant of God’s word. 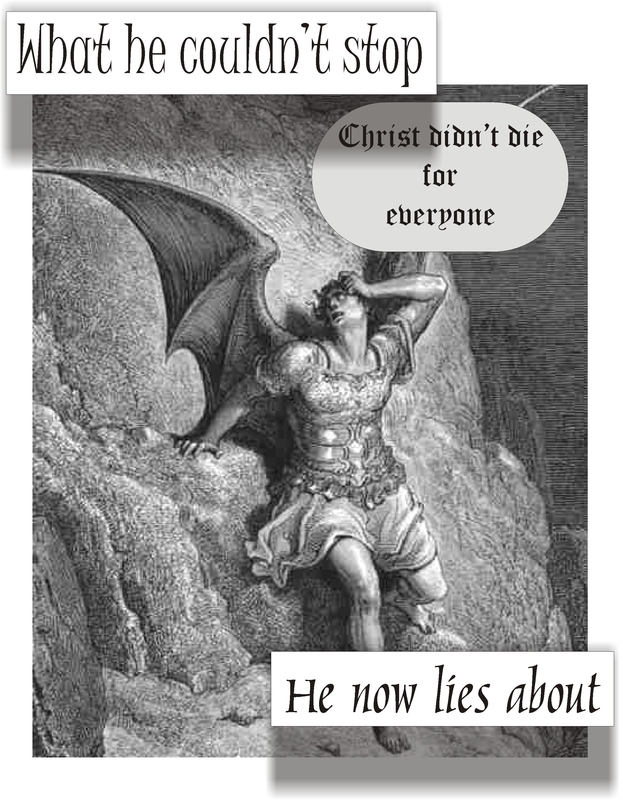 Satan in his lust to pervert God’s grace toward us has actually gotten a large part of believers to believe that Christ did not die for those who will never enter the kingdom of heaved. They say Christ only died for those who will accept Him. The Calvinist mumbles and jumbles and twist scripture to say what it does not. So again the question is, has God really said? Calvinism teaches that God’s grace is only for the elect and not the non-saved. They would say that the unsaved has God’s mercy, as in the fact He hasn’t judge them yet and He lets it rain on the just an unjust alike. But His grace is reserved solely for those who will come to a saving knowledge of Christ. But has God really said that? No He hasn’t. The Holy Spirit has said to us that the grace of God is extended to everyman through Christ. For Christ has tasted death for every man. Not some, not elect, but every man. So again, what has God really said? The question for the Calvinist is, will you keep saying to yourself, has God really said and believe a lie straight from the father of lies? Or will you embrace the gospel message that is presented by the Holy Spirit to us in scripture. Will you let God be God and give us His gospel message or will you now tell us that the word “every man” does not mean every man. Just like the word “world” doesn’t mean world or the word “whoever” doesn’t mean whoever? Will you always be stiff necked and say in your hearts, has God really said? To those of you who love the Lord and His word and are seeing the lies of Calvinism in light of scripture, the Holy Spirit is calling you out of that religion of man. Depart from this doctrine of man unto the life giving gospel message of the Holy Spirit that wishes to witness this to you on your heart of flesh. If you are a Calvinist and the Holy Spirit is revealing His word to you, let those of us who follow this web sight know, so you can be encouraged and prayed for by these fellow believers in the true grace of God. If you have questions in your search for the truth of scripture, ask, so readers of this blog can help you to come to a better understanding of God’s word. Let you light then so shine that you too can minister to those who come out of her. As it is written, come out of her my people.